Core Data is intricate, powerful, and necessary. Discover the powerful capabilities integrated into Core Data, and how to use Core Data in your iOS and OS X projects. All examples are current for OS X El Capitan, iOS 9, and the latest release of Core Data. All the code is written in Swift, including numerous examples of how best to integrate Core Data with Apple's newest programming language. Core Data expert Marcus Zarra walks you through a fully developed application based around the Core Data APIs. You'll build on this application throughout the book, learning key Core Data elements such as NSPredicate, NSFetchRequest, thread management, and memory management. Start with the basics of Core Data and learn how to use it to develop your application. Then delve deep into the API details. Explore how to get Core Data integrated into your application properly, and work with this flexible API to create convenience methods to improve your application's maintainability. Reduce your migration difficulties, integrate your Core Data app with iCloud and Watch Kit, and use Core Data in a queue-based environment. By the end of the book, you'll have built a full-featured application, gained a complete understanding of Core Data, and learned how to integrate your application into the iPhone/iPad platform. This book is based on Core Data in Objective-C, Third Edition. 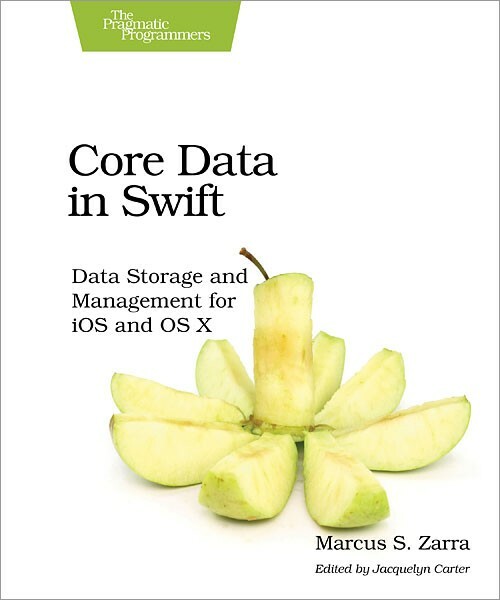 It focuses on Swift and adds an additional chapter on how to integrate Core Data with an efficient network implementation, with best practices on how to load and pre-load data into your Swift application.